Laura serves as Program Manager, Access to Finance. The objective of the program is to help increase investments in the sector that will allow it to scale up and accelerate the development of the off-grid market, leading to more people benefiting from clean, sustainable and economically viable off-grid lighting and electrification. 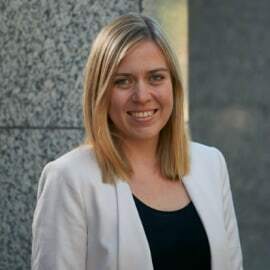 Prior to joining GOGLA, Laura worked at Arc Finance, where she oversaw staff training and consumer education efforts related to consumer financing for energy products and services, and led Arc Finance’s conferences and workshops on innovations in financing off-grid clean energy. Laura holds a Master’s degree in International Relations from the University of St Andrews, as well as a Master of Public Administration degree from Columbia University.